A Senate panel approved legislation on Thursday that provides a smaller pay raise for military service members than the one the House agreed to. The Senate Armed Services Committee reported out its fiscal 2015 Defense authorization bill, which includes a 1 percent pay boost for troops next year – the same amount that President Obama has recommended. Also on Thursday, the House passed its version of the legislation, which tacitly supports a 1.8 percent across-the-board salary hike. The 1.8 percent pay bump for troops is in line with the automatic fiscal 2015 cost-of-living adjustment scheduled for the military; there is not an explicit provision regarding a pay raise in the House legislation, but by staying silent, lawmakers are supporting the amount that would automatically take place under the law. If the Senate ultimately passes a bill with the 1 percent raise, the two chambers will have to hammer out their differences in conference committee. Military service members received a 1 percent pay boost in 2014. The Senate Defense authorization bill, like the House-passed version, also calls for a pay freeze for general and flag officers in fiscal 2015, as recommended by the Obama administration. The Senate panel approved other personnel-related White House recommendations, including a provision that results in a smaller increase for troops’ basic housing allowance and higher pharmacy co-pays from 2015 through 2024 for non-active duty TRICARE beneficiaries. 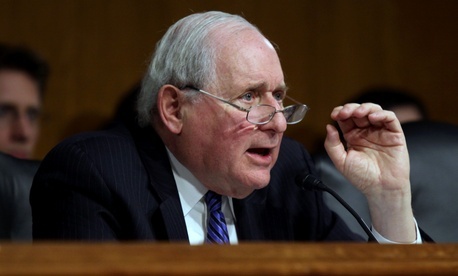 The panel, led by Sen. Carl Levin, D-Mich., however, rejected more aggressive White House recommendations related to TRICARE, such as creating enrollment fees for TRICARE-for-Life beneficiaries. Like their House colleagues, senators on the Armed Services Committee also rejected the administration’s recommendations to cut funding of military commissaries, the heavily-subsidized stores on base where service members and their families buy food and other goods. Another important provision in the Senate Defense authorization bill would grandfather those who first join the military before Jan. 1, 2016, from the reduced cost-of-living adjustments that apply to military retired pay. The current law grandfathers in those who joined the military before Jan. 1, 2014. Congress in February repealed a provision in the 2013 Bipartisan Budget Act that cut the pensions of working-age military retirees until they reach the age of 62. The reduced cost-of-living adjustment however, still applies to those who first join the military after Jan. 1, 2014. The bill also urged the Military Compensation and Retirement Modernization Commission to conduct a survey of active-duty and retired service members about pay and benefits, and includes a provision requiring the Defense secretary to review the effectiveness of the 40-year pay table.